Mr. Bristol joined the firm of Henry, Henry & Bristol in 1990 and has practised since then in Grenada. 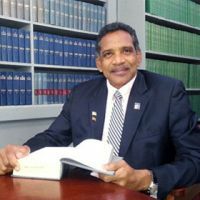 Mr Bristol has worked extensively in St Lucia as counsel and qualified as a mediator through the Centre for Dispute Resolution in England. Mr. Bristol is a former aircraft engineer and served as the Chairman of the Air Transport Licensing Board in Grenada as well as on the Board of the Airport Authority and its subsidiary ground-handling company. Jimmy, as he is better known, is keen on sailing and was the chairman of the Grenada Sailing Festival for over fifteen (15) years since its inception in 1994. He is also a national yacht racing judge and has judged regattas in Grenada, St.Vincent & the Grenadians (the Bequia Easter Regatta) and St.Thomas US Virgin islands (the Rolex Regatta). Practice Areas: Mr Bristol practises mainly in the areas of commercial law, including banking, corporate law and civil litigation taking cases up to the Grenada’s final court of appeal, the Privy Council in London. Qualifications: Mr. James Bristol received his legal education in England and was called to the bar of England & Wales in 1989. Experience: Mr. Bristol served as vice president of the Grenada Bar Association in 2007, and as president in 2008. Mr. Bristol was re-elected President of the Bar in July, 2012 until March 2014. He served as Grenada's Attorney General from 2008 to 2009. As a way of giving back to the profession, Mr. Bristol has been honoured to act as a Judge of the Eastern Caribbean Supreme Court. Bar Admissions: Admitted in Antigua, Barbados, England & Wales, Grenada, St. Lucia, Trinidad.